As I said before, I had my Xmas a little early this year (as my family does every year.) One of my presents was the Mage Knight expansion: Lost Legion. Now, Mage Knight is an ingenious game. It is challenging, flexible, thematically rich and its mechanics are, for the most part, pretty intuitive. So what can an expansion bring to the table? Basically, more of the same. This isn’t a bad thing when you’re already on to a winner. A new Mage Knight to pick, a handful of new spells, actions and some new enemies make up the bulk of the meaty stuff. They also took the opportunity to tweak the rules but when you read the changes it’s a bit like reading a video game’s changelog when it says: “Increased the wizard’s damage output by 0.02% over 3 seconds, and reduced the cooldown on the fighter’s shield bash by 0.1.” Honestly, if you were noticing these figures you’re clearly autistic. From here on out, if you aren’t actually familiar with the base Mage Knight game, it might all go a little over your head. 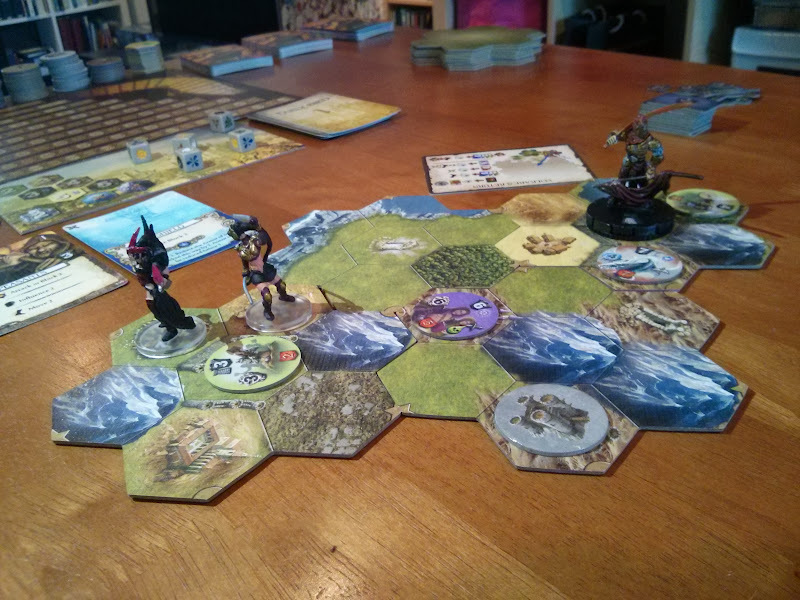 So: New enemies, and a new Mage Knight. Great. There is of course the titular Lost Legion. The Legion is utilised in a couple new scenarios that have one incredibly strong army. A bit like combining several cities together at once. Added to that, they have a simple AI and march around the map revealing tiles and looking for the one city in the scenario. Once found, your objective is to get to the city first, assault it, then defend your new city against the legion. I like it. A lot. I like it a lot more than finding and assault cities, but it certainly hasn’t improved Mage Knight’s only remaining problems and it’s not perfect. We moved and explored, and avoided the legion (hereafter called “Volkare” since that is their leader’s name and the figure represents him.) At one point Volkare found and attacked me putting three wounds in my hand. Not great, but bearable. As the game wound down – some 6 hours later – I started to wonder if we were anywhere near strong enough to fight Volkare’s army. It was truely massive and we’d played on one of the easiest difficulties. He had 2 white, 2 draconum, 6 green, and about 3 or 4 greys. When assaulting a big city, you might fight 1/3rd that and it is incredibly tough! I’d realised that by this point in the game we should have been somewhere between level 7 and 10, and we were actually level 5. The problem seemed to me that the scenario had too many country-side tiles which don’t grant enough experience. My fears never came to fruition, though. We got down to the last tile. We knew it was the city. We decided that we had better use Space Bending exclusively to explore a tile so we would find the city near us and Volkare wouldn’t find it before us. Unfortunately, despite picking quite high tactics, Volkare pulled the #1 round position, went first, pulled the exact card needed to move and revealed the last tile. This put him adjacent to the city and us on the other side of the map. He moved in next turn and it was game over. On one hand, I was sort of relieved. The game had been going for 6 hours (barring a break for food) and probably would have taken another 1.5hrs to finish off if we’d revealed the city. The game has turns and rounds. You have several turns to 1 round. I wanted to know the sequence of actions required to end a round. You might think there’d be a section on “rounds” that outlines the structure of a round and what to do when one ends. Nope. You might think because the end-of-round is the last thing that happens (before we start from the top and do it all again) that it’d be at the end of the rules – just prior to special scenarios and appendices. Nope. Do you want to know where it is? I have no idea. I just went to look so I could tell you and I seriously couldn’t find it. The thing is: I know what to do at the end of round, because I read it somewhere. The rules are really quite intuitive, so the rules are easy to remember, but if you need to know some niggly detail – do you put the spells at the bottom of the pile, or discard them when refreshing the offer? – good luck finding it. Alas, Lost Legion followed the exact same pattern for rules structure. I had got all the Mage Knight rules down so I didn’t have to refer to the book any more… with Lost Legion I had to refer to it a couple times and woe betide the poor soul that dives into those books seeking answers.